Mystery Shopping jobs is a fun and interesting part-time work to earn money from home and in nearby companies. Feel the power of deductive, working as a mystery shopper. The mystery shoppers are hired in order to evaluate various businesses and the services offered by the companies. This is a kind of market research done to improve the standard of the companies. So, mystery shopping job is like Quality Analyst job post in industries. Whether you’d like to sit in your home or do fieldwork, earn up to $30/hr working as a mystery shopper with fun. 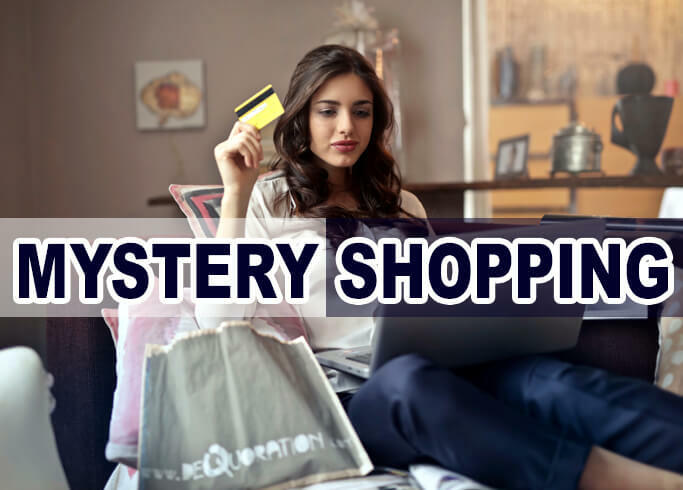 The Mystery Shopping is the process of evaluating the quality and other important elements of a business or company or service either directly or indirectly. The mystery shopping companies hire mystery shoppers in order to perform the quality check process anonymously. In turn, the mystery shoppers receive rewards for completing the mystery shopping assignment. Since the industrial age, the mystery shopping process played an important role in improving the standard of businesses, companies, and organizations. Usually, the mystery shopping is carried out as a secret operation because only then the results can be accurate and perfect. The mystery shoppers will have to hide their identity and shop as general customers or visitors and complete the mystery shopping task(s). So, the people who are doing this job is also known as the secret shopper and the process are called secret shopping jobs. The shop or service or company that has been evaluated by the mystery shopper will don’t know that they have been assessed by the mystery shopper. Based on the instructions, the evaluation can be in-depth or simple. The companies who are in need to improve their standard will approach the mystery shopping companies to hire the mystery shopping professionals to evaluate. Be advised that mystery shopping does not mean earning cashback while shopping. It’s a quality assessment process, not a general shopping. Here are some of the examples of mystery shopping jobs. This will help you to understand the mystery shopping processes. the speed of service completion, and more. In the case of online mystery shopping, the mystery shopper can work from home instead of approaching the field directly. After the mystery shopping process is complete, the mystery shopper will submit the data to the mystery shopping company. The company will collect the data from multiple mystery shoppers and submit the reports to the company. The companies will analyze the consumer insights to learn the shoppers base, customer needs, the quality of the service and more. This will vary based on the companies and their customized needs. The purpose of collecting the insights are to improve the quality of the service, increase the leads & sales, improve the branding & reputation, locate the potential business hazards, get rid of employees without stuff to work and make the important decisions like promotion, business proposals etc. The mystery shopping jobs are similar to user testing jobs which also the best job for the noobs. The mystery shopping cases we’ve seen above is related to the field mystery shopping. Here, the mystery shopper will be assigned to perform mystery shopping job walking into a shop or company. The mystery shopper should work on the field to earn money. In this case, it is not a kind work from home job. This is a kind of interesting work where you can have fun and earn money at the same time. Apply for the job, get hired, and complete the tasks in the field which might take 15 – 45 minutes. Submit the report after completing the task to get paid. Field mystery shopping is a great job for the students, part-time job seekers, and freelancers. Earn $10 to $20 per mystery shopping task based on the company you work for. Telephone mystery shopping is a great online job for housewives, work at home moms, students and people who wish to work from home. To work as a telephone mystery all you need is a phone to make the call(s). In the telephone mystery shopping job, you will have to asses the employee of call based services like BPO call centers, KPO call centers, customer support etc. Earn up to $5 per call which might last up to 10 minutes. In the phone call, you must act like a normal customer and follow the instructions given by the company. The call might be recorded sometimes as a part of telephone mystery shopping. The market research survey is simplest and available for almost all the internet users. Market research survey does not directly come under the mystery shopping job. However, it is a part of mystery shopping. Plus no special skills required to take market research surveys. Surveys are the market research studies conducted in order to learn the consumer views about the products and services. The same survey will be taken by thousands of qualified users. The outcome data will be processed to useful information. This will be used to improve the products and services offered to the customers. Market research surveys pay $0.50 to $5 per job completion. It might take 5 minutes to 20 minutes to complete a survey. The availability of tasks will be more in this case compared to field mystery shopping and telephone mystery shopping. If you wish to work for market research companies, here is the list of best market research companies. Need to be authentic and knowledgeable. Must have devices like PC, Laptop, smartphone, tablet(if applicable). Reliable internet connection to connect. The right set of skills with good telephone presence(telephone mystery shopping job). Require good language skills, evaluation skills, and writing skills(if applicable). Ability to complete the task within the allotted time is a must like it is for virtual assistant jobs. If you got the skills to do it, apply for the mystery shopping jobs in the companies listed below. Also, check out some of the best online jobs. Find the list of legitimate mystery shopping sites to become a secret shopper. 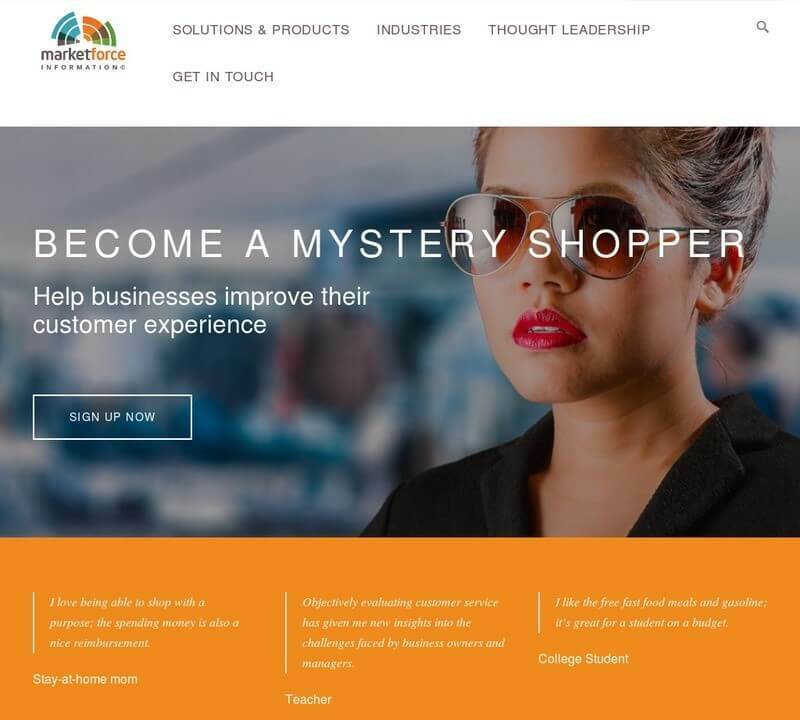 The MarketForce is an award-winning mystery shopper company works to help the businesses to improve their user experience. Founded in 2005, Marketforce continues to grow in locations including USA, UK, France, Canada, and Spain. They manage to satisfy their clients even if they complete over 100000 mystery shops per month. They process millions of requests and surveys with accuracy. 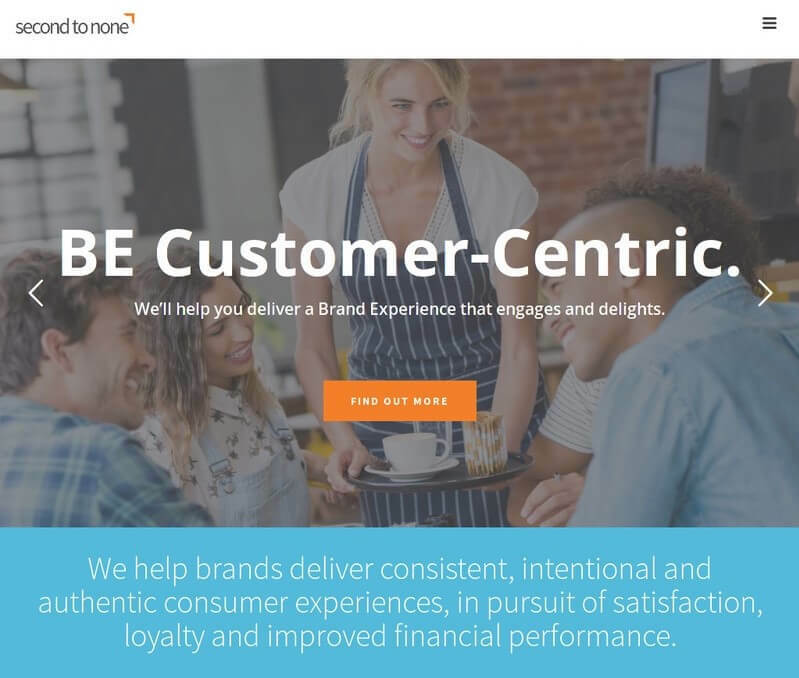 Their company provides market research services including mystery shopping, customer experience surveys, contact center calls, employee engagement survey, social media surveys. Sign up on the Marketforce for free and Get paid to eat and shop for free at your favorite brands. The Marketforce mystery shoppers create an impact in the local communities by helping the businesses to make their services a better one for their consumers. Shop in some of the biggest brands and the stores you visit already such as Gas stations, fast food, movie theatres, fashion brands, restaurants, drug stores, mobile operators etc. The Marketforce will pay shopper rewards or reimbursements for the free purchase. You can use their Eyes-On™ mobile app to make money. Download the app on your Android smartphone or iPhone, browse the mystery shopping jobs available near you. Complete as per your convenience and manage your earnings & account direct using their app. The Bestmark is the world’s best mystery shopping company with brilliant mystery shoppers. They provide mystery shopper jobs in order to represent some of the best organizations. Their clients include resorts, restaurants, casinos, retail stores, financial institution, hotels and more. 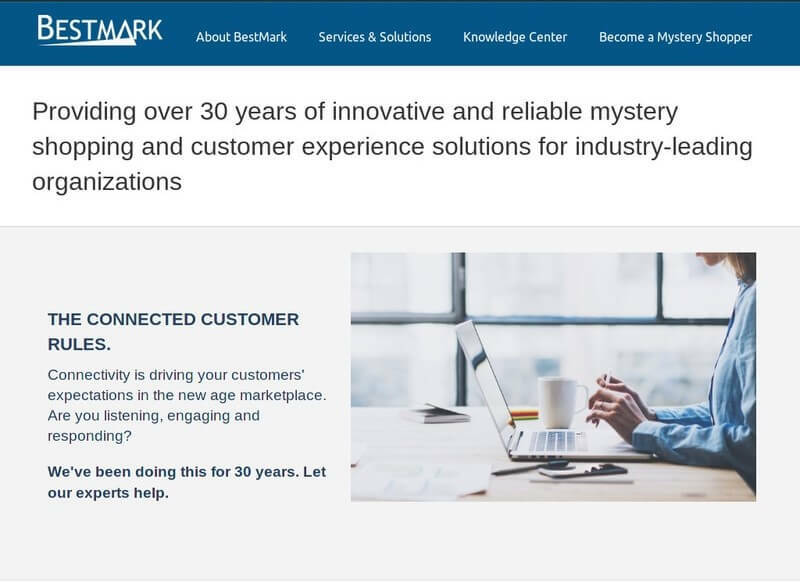 To maintain their excellence, Bestmark screens each mystery shopper job and exit interviewer applicants on an ongoing basis. To become a mystery shopper in Bestmark, no previous experience needed but you must meet these criteria. You must be the US or Canada resident minimum 18-year-old, must have a reliable transportation, should have good written communication skills, must have an internet connection to work from home as a mystery shopper and you must be able to follow the instructions with a focus on details. More than 10000 mystery shopping tasks are assigned to their members each month. Complete the mystery shopping jobs within the time frame and get the paycheck mailed to your address. Else get paid via PayPal, direct deposit or redeem cash for gift cards. The Intellishop is a modern company that works on building a better customer experience for their clients. Intellishop is looking for the experienced mystery shoppers with Gold or Silver MSPA certification. The jobs are assigned by Intellishop based on the shopper rating. So, the mystery shoppers are advised to improve their rating by writing through reports and post-shopping experience. The mystery shoppers must follow the instructions very closely and completing the assignments on time. Apply for the mystery shopping job today and get the chance to work on their clients. Get paid via PayPal at the month end. The Second to none is seeking male and female consumers across the USA and Canada who enjoy interacting with people, have excellent observation skills, good time-management skills & communication skills and have a computer, tablet or smartphone with the reliable internet connection to work. Second to none help to improve customer services in many industries. Join Second to none as a secret shopper to earn an extra income and get reimbursement for the meal for doing restaurant assignment. Shopping assignments are very flexible that will fit your schedule in most cases. They pay once a month to the bank account via PayPal or direct deposits. Join second to none for free to work as a mystery shopper. 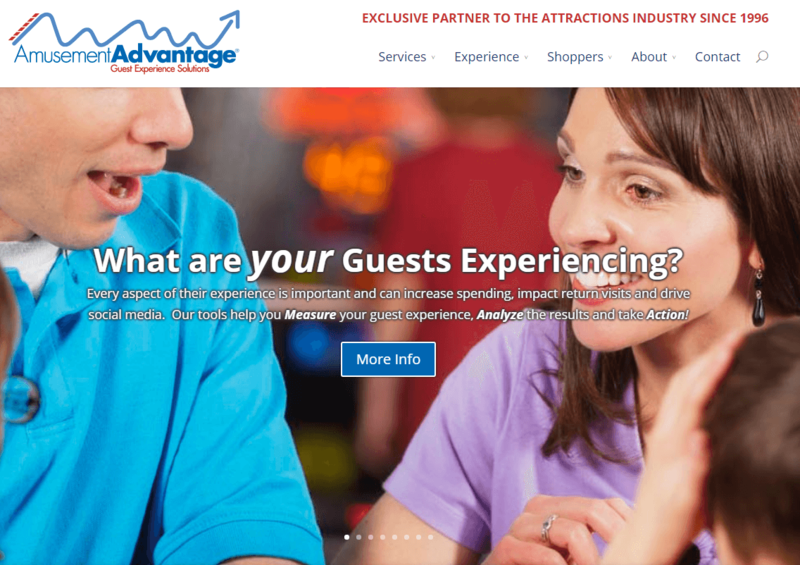 Amusement Advantage is one of the pioneers of mystery shopping. They provide mystery shopping program to monitor guest satisfaction, cleanliness, safety and loss prevention. They are masters in creating the custom tailored program based on the clients’ requirement using industry standards. If you’re a picnic lover, then Amusement Advantage is going to help to earn money for enjoying your day. They are seeking professional, positive, experienced shoppers who to visit amusement facilities like water parks, Zoo, Museum, theme parks, aquariums, entertainment centers, skating centers and more. The new shoppers are advised to include a detailed writing sample in the shopper profile to increase the odds of getting a job. Most of the jobs are posted on Friday that should be completed within the weekends. So, the Amusement Advantage is going to be a great source for full-time workers to enjoy their weekends with free tickets and extra money. Amusement Advantage processes the payments through PayPal within 30-45 days from the date of submitting the report. Find the list of best companies to earn money participating in market research surveys. Clixsense is one of the best market research companies in the world partnered with thousands of advertisers to provide money making opportunities to their users. While most of the mystery shopping sites only support residents from tier – 1 countries like USA, UK, Canada…. The Clixsense accept members from almost every part of the world. Clixsense is not only the place to take market research surveys but also get paid to click, complete micro jobs, offers, and more. Average users earn up to $500 per month working on Clixsense. Earning money on Clixsense is very easy and they have millions of members in their community to help you. Join Clixsense for free and start making money right away without any approval process. Find surveys and tasks posted 24 x 7 on Clixsense, earn anytime and using any device including mobile phones. Clixsense pay their members through Payoneer, Skrill, Check, Dwolla and more. 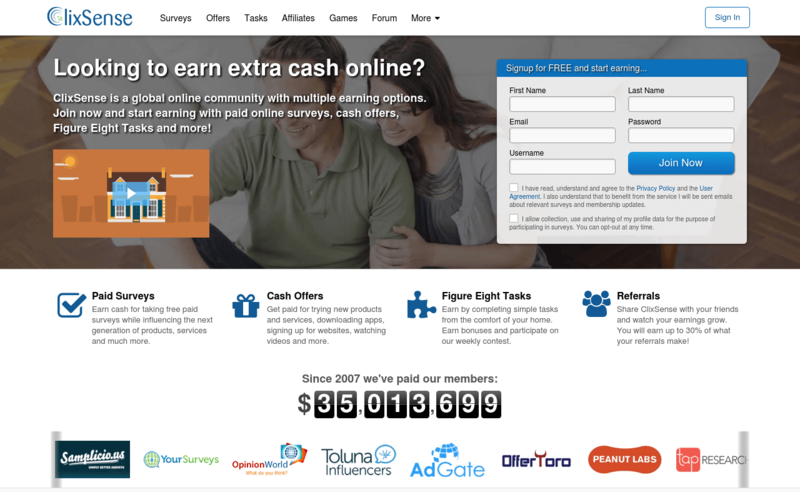 Swagbucks is a company similar to the Clixsense with a lot of survey opportunities. This site works great for the internet users from tier – 1 country including the USA, UK, Australia, Canada, New Zealand, Ireland, and few more countries. 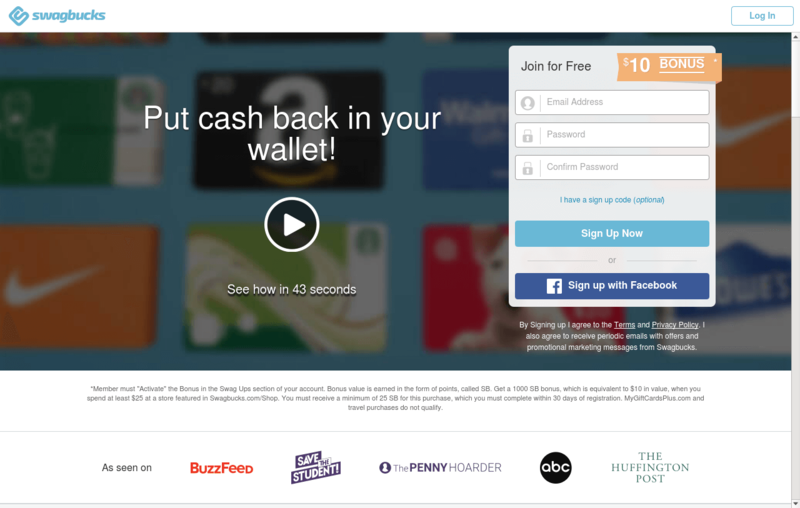 New users earn $10 bonus as soon as they become a part of Swagbucks. Apart from market research surveys, the Swagbucks users can earn money by searching the internet, completing tasks & offers, answering polls, get paid to read etc. Swagbucks also helps the members while shopping online by providing coupons and cashback offers. Members can redeem the earned SB for cash using PayPal and gift cards of major brands in the world like Amazon, Walmart, Flipkart, Target, Facebook, Google Play, Steam, Macy’s etc. The minimum payout is only $5. Unfortunately, like the data entry scams, there are mystery shopping scams which seems to be a headache to the job seekers. Here are some of the steps to avoid the mystery shopping scams. Do not believe in fancy schemes and high payment promises. Legitimate mystery shopping companies will never promise to pay more money. Expect just $5 to $20 per session. Never pay registration fees or premium deposits to any company that asks you in order to hire you. Legitimate Mystery shopping companies will never ask for registration fees. Few mystery shopping companies might ask you to spend money to buy tickets and pay for the meal while shopping. Usually, genuine mystery shopping companies will reimburse the money spent. Mystery shopping scams might cheat you. The best thing you can do to find the legitimacy of a mystery shopping company is, check if they pay through PayPal. The PayPal approves the mass payments for a company only after certain background and business verification. So, sites that pay through PayPal are less likely to be a scam. Mystery shopping sites that offer Western Union payments should be approached with caution. However, it is just a sign but not a proof of the scam. The best thing you can do is work as a mystery shopper on the tested sites listed above. A fun and interesting way to earn money. Work from home or work in the field by choosing the assignments that match your interest. One of the simplest online job and reliable part-time work. Few mystery shopping companies allow you to earn money using mobile phone. Work at your convenient timing as long as you can complete the task within the specified time. Full-time workers can earn money at the weekends. Get a free meal, free tickets to theme parks, free products as a field mystery shopper. Convenient job for students, work at home moms, and housewives. Get paid via PayPal, Check, Bank transfer and Gift vouchers. The availability of mystery shopping jobs is not so promising. Mystery shopping scams are a concern. Most of the jobs are only available for residents of tier -1 countries. Not all the internet users are fit to work as a mystery shopper. That’s all about Mystery shopping jobs. Leave your comments below to share your experience as a mystery shopper. Also, feel free to check the best freelance sites to start your own work from home business.